One of my five easy steps to cultivating an elegant appearance is so easy that it’s often ignored or overlooked: wear a pocket square. You’ve got a breast pocket on your jacket, put something in it. Especially given today’s trend of not wearing a necktie, a pocket square can add some visual interest, not to mention personality, to your clothing. There are about a thousand ways of arranging a pocket square, but I rely on only two: the reverse puff and the straight fold. If I’ve got time, I like to fold a square into a “shell” for a change of pace. But more often than not, I simply cover my fist with the material, poke a finger into the middle of it, draw the material through my fist and fold up the bottom. The whole thing gets stuffed into my pocket, sometimes with a puff of the “bottom” part peeping out of the corner of the pocket nearest the lapel. And don’t think that you are limited to silk or white linen. I’ve used a pink or blue bandana (like our gent in the photo above)during the summer months with a linen patch pocket blue blazer. But whatever you do, DON’T buy one of those matching tie and square things, it lacks that studied carelessness — sprezzatura — that is essential to elegant dressing. 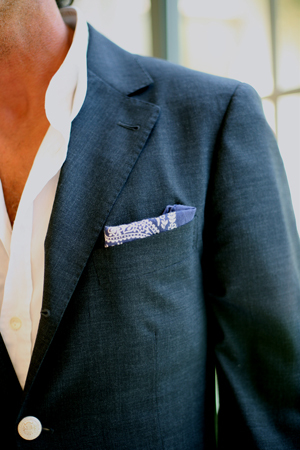 Ditto for matching the plain silk square to the shirt of the same color when you’re tieless. The only good match that way is the white linen and white shirt combination. Otherwise, mix it up! Sinatra was known for wearing his favorite color orange in pocket squares. This entry was posted in Elegantology and tagged clothing, Elegantology, pocket squares. Bookmark the permalink.